Very Motivated Seller. It won't Last art this Price!! Offering a comfortable and open floor layout, this cozy residence offers over 1700 sq ft of living space and features central air & heat system, laundry room with side by side hook-ups, semi-formal dining room, 3-car garage and over 29K sq ft of LAND!! Entry opens to soaring 9 ft + high ceilings with recessed lights, new carpeting and laminated floors, a modern wall fireplace with stone accent, kitchen views and a sliding glass door to the rear yard. This modern kitchen showcases granite counter tops, wood cabinetry, breakfast bar, and built-in stainless steel appliances (delivered after escrow). Secondary bedrooms feature carpeting, sliding wall closets, base moulding, lighting fixtures and a shared hallway bathroom. The Master bedroom features a ceiling fan, walk in closet with additional sliding wall closet, private master bathroom with dual sinks, and a glass sliding door to the rear yard. Bring your imagination and create the rear yard of your dreams. 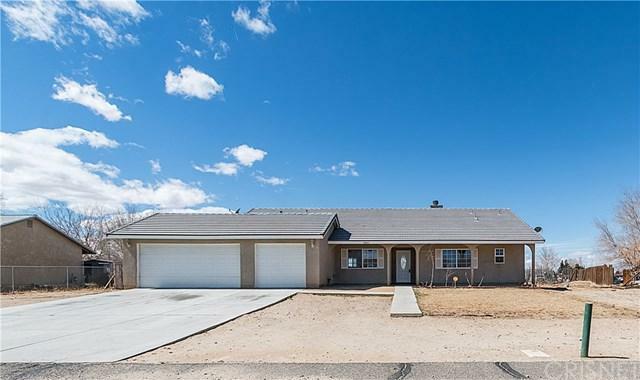 Ample flat usable land offers tons of room for growth and possibility. Sold by Maria Dominguez of San Fernando Realty, Inc..